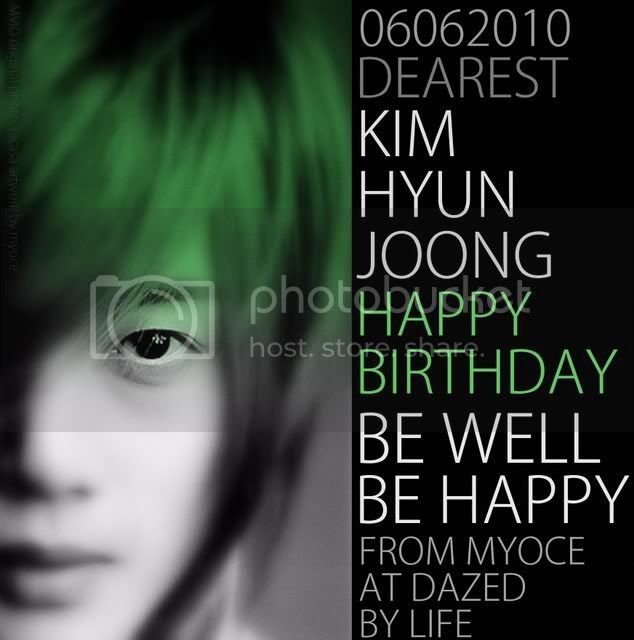 Well, it's already Hyun Joong's Birthday in Korea. I wonder what time he was born? My mom said I was born at 5 in the morning....a coincidence, because I gave birth to my 2 children at about the same time...very early in the morning. Now I'm tongue tied and don't know what to say any more ! LOL.. Happy Birthday Dearest Leader ! Very NICE card Myoce! I'm very sure that KHJ will be impressed if he sees it. Thank you so much, Lynne. Have a nice weekend, Lynne ! Sorry for my rambling. Keep up the great work! Dear Lynne,thanks a lot, your words really motivates me to continue blogging ! I'm glad visitors are patient with my style of blogging with late /no updates and slow reply to comments. Thanks again !